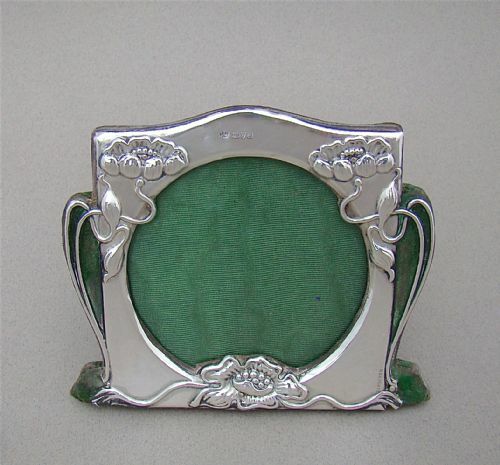 This superb Victorian embossed silver photo frame was made by the celebrated William Comyns and is dated London 1900. 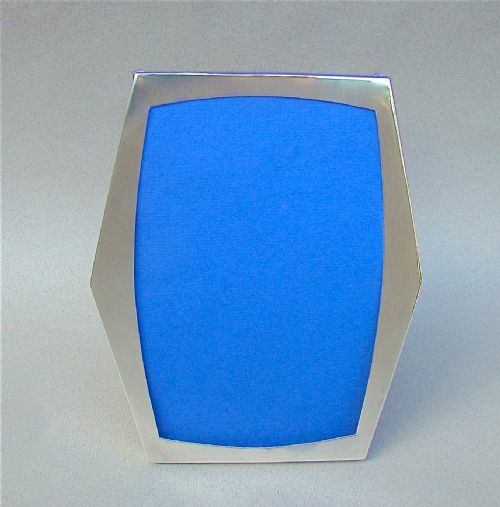 Landscape frames are much more difficult to source and this is a stunning example by a celebrated silversmith. Of rounded rectangular form, embossed with playful putti within foliate scrolls. the top with vacant cartouche. Blue silk lining and original velvet back and easel. Width: 17cm / 6.4 inches. Height: 12.5cm / 5 inches. Width: 12cm / 4.6 inches. Frame in very good condition, with no loss to the decorations. The velvet back and easel worn but in good working order. This is a very elegant Art Deco solid silver photograph frame made in Birmingham 1927 BY E Mander & Son, who were specialist frame makers.. It has a fine engine-turned finish and an elegant arched outline. The top with vacant oval reserve. The back of the frame with an oak back and easel. Date letter "C" for 1929. Maximum height: 21cm / 8.3 inches. Width: 13.5cm / 5.2 inches. Width: 11.5cm / 4.4 inches. Frame in good condition, with minor surface scratching commensurate with age. 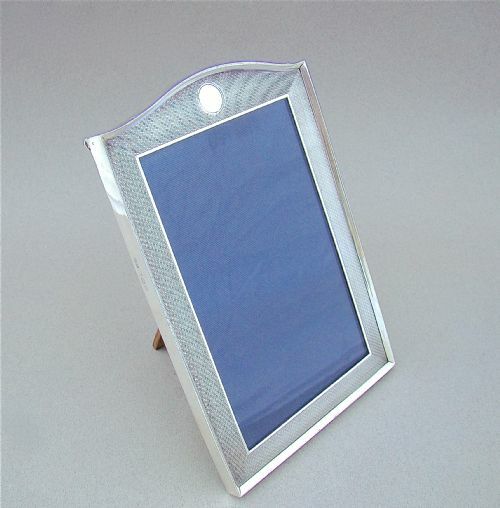 This is a very elegant Art Deco solid silver photograph frame made in Birmingham 1922. The top with vacant roundel. Maximum height: 18.5cm / 7.2 inches. Width: 12.5cm / 5 inches. Height: 14.4cm / 5 inches. Width: 9.5cm / 3.4 inches. 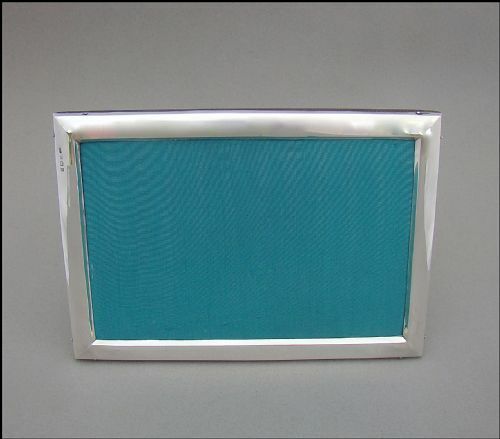 This stylish and unusual medium-sized sterling silver photo frameswas made in Birmingham 1912 by the specialist frame makers Baldwin & Marriott. 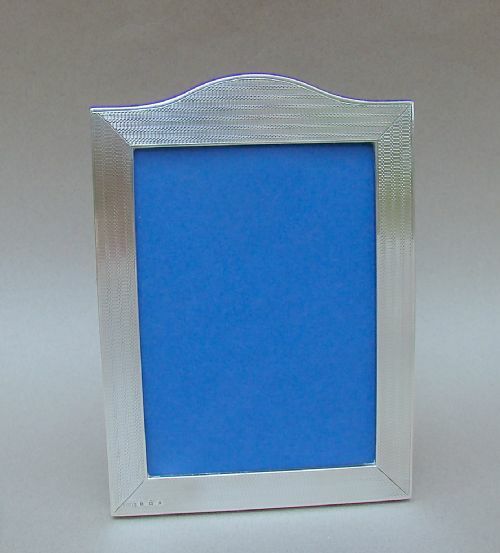 The plain silver frame with an elegant hexagonal outline. Date letter "n" for 1912. Height: 16.5cm / 6.4 inches. Maximum width: 13.5cm / 5.2 inches. Frame in very good condition. 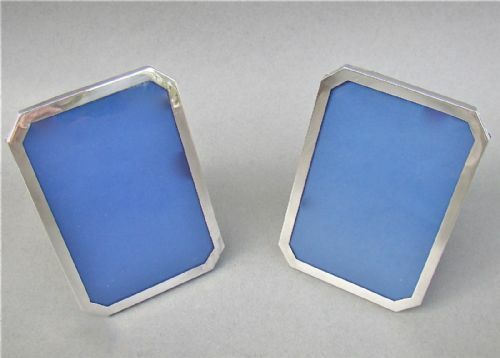 This stylish medium-sized pair of solid silver photo frames was made in Birmingham 1924 by the specialist frame makers Baldwin & Marriott. Each frame with a simple and elegant rectangular form with canted corners. Width: 9.5cm / 3.2 inches. Width: 8cm / 3 inches. 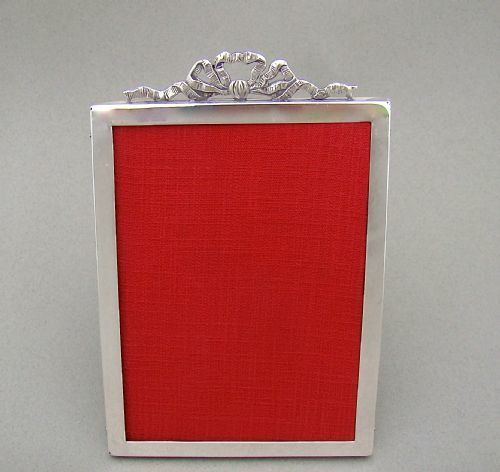 This unusual and exquisite small-sized solid silver photograph frame is dated Chester 1902. It very much reflects the Art Nouveau movement with its sinuous flower decorations and flowing outline. Original green velvet back and easel. C.C for Colen Hewer Cheshire. Back velvet a little worn. Width at widest: 11cm / 4.2 inches. 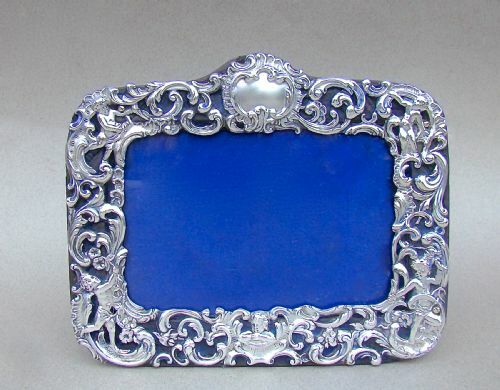 This delightful medium-sized Edwardian silver photo frame is dated London 1901 and was made by William Hornby. 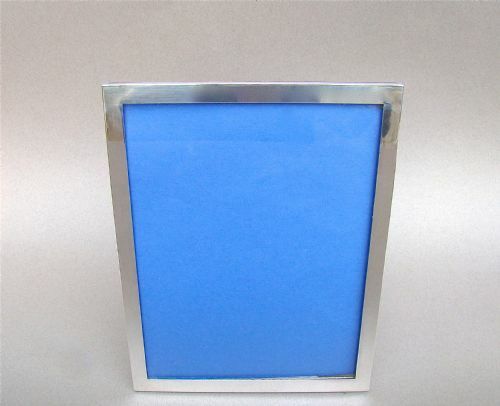 The plain sides surmouted by with a decorative cast silver ribbon. Original red leather back and easel. Date letter "f" for 1901. Silver in very good condition with very minor surface scratching commensurate with age. Leather back is in good original condition. Marks a little faded but identifiable. Height (excluding ribbon decoration) : 14.5cm / 5.4 inches. Width: 11cm / 4.2 inches. Width: 9.5cm / 3.5 inches. 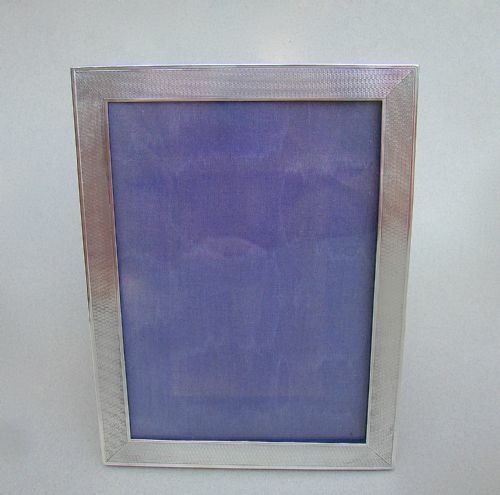 This very elegant and good size Art Deco solid silver photograph frame was made in London in 1926. It has a fine engine-turned finish and a pleasing light oak back and easel. Date letter "l" for 1926. Width: 15cm / 6 inches. Height: 17cm / 6.6 inches. 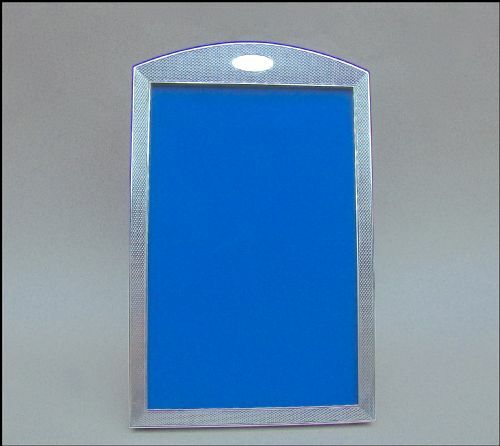 This is a very elegant Art Deco solid silver photograph frame made by the British Metallising Co Ltd, active in London in the Art Deco era. The back of the frame with a bakelite border and an ebonised oak back and easel. Registered patent number on hinge. Date letter "o" for 1928. Height: 17cm / 6.4 inches. Width: 12cm / 5 inches. 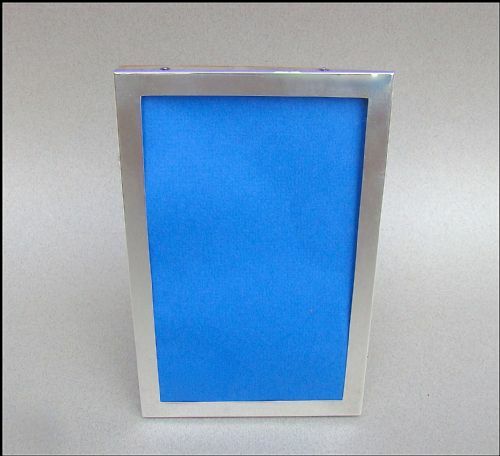 This good sized solid silver photo frame was made in Birmingham 1910. Landscape frames are few and far between and this is a simple yet elegant example. Plain silver chamfered sides, reconditioned leather back. SML for Samuel M Levi. Width: 20cm / 7.6 inches. Width: 17cm / 6.6 inches. The leather back and easel was probably redone at one stage but works well.